Big Data powers the modern world. What do we gain from Big Data? What do we lose? Al Jazeera America examines the role of technology and the implications of sharing personal information in the network’s first graphic novella, Terms of Service: Understanding Our Role in the World of Big Data. 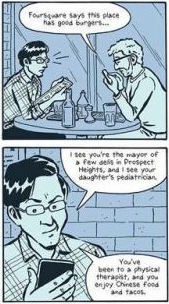 The new comic novella, available on Al Jazeera America’s website at http://projects.aljazeera.com/2014/terms-of-service, is a thought provoking, entertaining field guide to help smart people understand how their personal, and often very private, data is collected and used. Co-produced by well-known cartoonist Josh Neufeld and Al Jazeera America reporter Michael Keller, Terms of Service is an entertaining feature that follows characters “Josh and Michael” as they journey through the challenges of digital privacy and other issues consumers should be aware of in the “brave new world” of technology and Big Data. The comic attempts to entertain and educate readers while providing a solid foundation for them to begin asking their own questions. Between social media profiles, browsing histories, discount programs and new tools controlling our energy use, there’s no escape. As we put ourselves into our technology through text messages and photos, and use technology to record new information about ourselves such as FitBit data, what are the questions a smart consumer should be asking? What is the tradeoff between giving up personal data and how that data could be used against you? And what are the technologies that might seem invasive today that five years from now will seem quaint? How do we as technology users keep up with the pace while not letting our data determine who we are?